I use sweet potatoes a lot in our little corner of the world. They work very well in breakfast dishes and offer more health benefits than white potatoes. One of my favorite dishes is a simple egg and hash scramble. I can use colorful fresh veggies--and even make most of this dish ahead to make my mornings a little easier! This Sweet Potato Hash Breakfast Scramble can also be easily adapted to meatless eating by simply leaving out the turkey sausage. What is my recipe for a busy morning Sweet Potato Hash Breakfast Scramble? We may receive slight compensation from affiliate linking within our posts. All opinions are our own and we only link to products that we use and would recommend. Cook the ground turkey sausage. Crumble the turkey sausage into a medium, nonstick skillet and fry until browned. I do not add any oil to the turkey at this point--if it is a little too lean, add a teaspoon or two of water to help avoid sticking. Prepare the Sweet Potatoes. While the turkey is browning, prepare the sweet potatoes. Add 2 tsp. coconut oil to a skillet and heat until hot. Add the sweet potatoes and saute over medium heat for about 5 minutes. Add the peppers and onions to the pan and continue to cook until the sweet potatoes are fork tender and the peppers and onions soften. Mix in the hash ingredients. Add the remaining tsp. of cooking oil to the cooked turkey sausage. Add in the sweet potatoes and peppers and onions. Season with sea salt, pepper, thyme and garlic powder. Scramble the eggs into the skillet and cook over medium heat until the eggs are set. Serve. Place a hash serving onto each of four serving plates or bowls. We like to serve with wheat toast. Busy Day Breakfast Tip: Breakfast is the first thing to go when I have a busy morning. If I have to spend 30 minutes chopping and sauteing--I will opt to grab a processed cereal bar or skip the meal entirely. 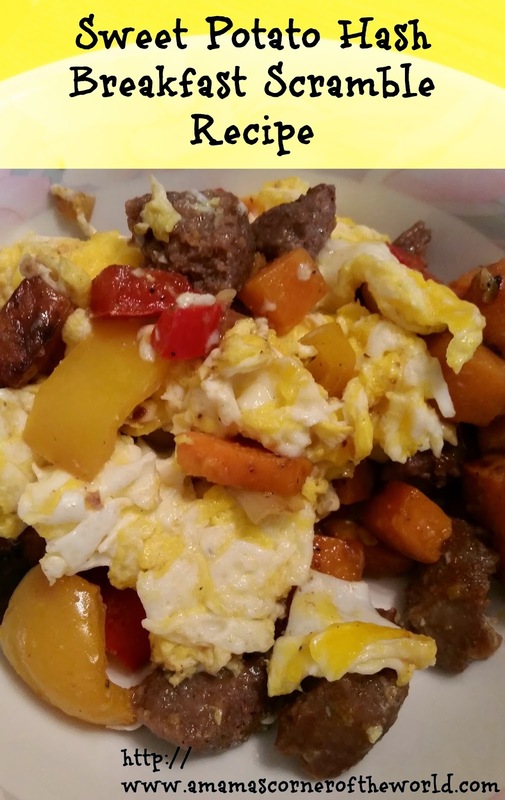 I will; however, take 5 minutes to scramble eggs--so, I prepare both the sausage and the vegetable portions of the hash on non-rushed mornings (usually a Sunday) or during the evening along with dinner--and store them in the refrigerator. When I am ready for a breakfast--I add about 1/2 cup of the vegetables and 1/4 c. of the ground turkey sausage to a heated frying pan, scramble in the eggs and cook until the eggs are set. In less than 10 minutes, the hash reheats and I have a hot, healthy, "busy-day" breakfast!